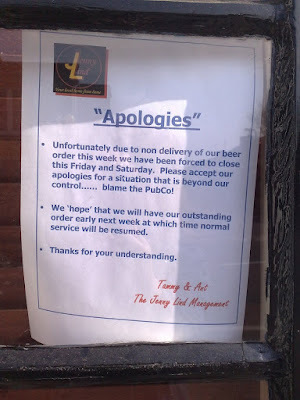 The “Blog” of “Unnecessary” Quotation Marks: we're real "sorry"
Kate spotted this in Hampton Hill, England. I can tell that these folks are real "sad" to not have to work this weekend. They'll be crying the whole time they are at the beach. I think a lot of people use the double quotes for emphasis, as a substitute for bold text or underlining or - in the case of internet English - ALL CAPS. "Wow. For the second day in a row, the editor in me has a tear in her eye. It is so nice to know that there ARE other people out there who cringe at this sort of thing. Over the last few years, I have definitely noticed that the grammatical ability of the American public is rapidly spiraling downward. Perhaps it is simply language evolution and I just need to get over myself (and it). Still, I doubt I will ever get over the increasingly common misplacement of the apostrophe (NOT NEEDED WHEN PLURALIZING!) and the often incorrectly used "they're/their/there" or "your/you're." I suppose teaching grammar just doesn't matter anymore? (wtf???)"